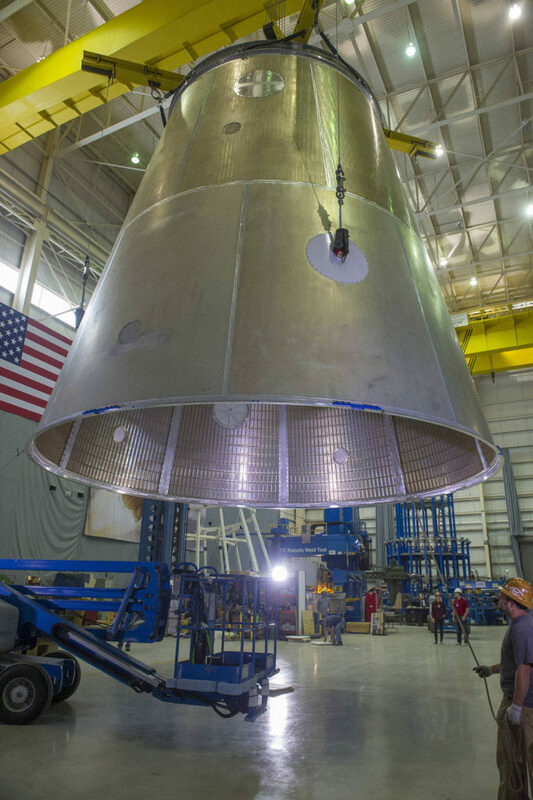 June 13, 2016 – A structural test article of the launch vehicle stage adapter (LVSA) for the Space Launch System (SLS) was recently completed at NASA’s Marshall Space Flight Center in Huntsville, Alabama. The LVSA will connect two major sections of the upper part of the SLS — the core stage and the interim cryogenic propulsion stage (ICPS) — for the first flight of the rocket and the Orion spacecraft in 2018. The hardware’s cone shape is due to the ICPS having a smaller diameter than the rocket’s core stage. Later this year at Marshall, the test version of the LVSA will be stacked with other structural test articles of the upper part of SLS. Engineers will examine test data and compare it to computer models to verify the integrity of the hardware and ensure it can withstand the forces it will experience during flight. When it’s complete, the SLS will be the world’s most powerful rocket and carry astronauts in NASA’s Orion spacecraft on deep-space missions, including the journey to Mars. Teledyne Brown Engineering of Huntsville is the prime contractor for the LVSA.